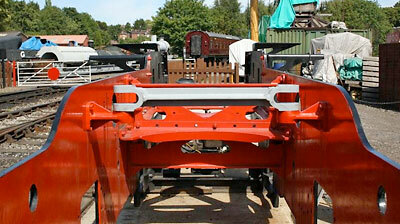 The firebox support bracket is now fitted in the chassis. It was smoothly lowered into place courtesy of Brian Malyon's expert handling of the JCB. We thank our friends at The Boro' Foundry for their excellent work in machining this heavy casting. After a pause of a few weeks the machining of the backing plates for the horn guide manganese liners is underway again. Fabrication of the cross stays is well advanced but there is all the machining of the fork ends to be done afterwards. Some steel has been purchased for the footplating around the front of the loco, not a priority job but nonetheless it will give a more complete and attractive appearance to the front end of 82045. Our annual tombola will be held at the SVR Autumn Steam Gala at Bridgnorth (23rd-25th September). Contributions are welcomed to make a success of this popular event and may be delivered to Brian Oldford at his pattern shop or on Mondays to any of the engineering team to be found (usually) working on 82045. Please help us - we have some expensive wheels to buy! `Tank45£5 to 70070`. You will receive an acknowledgement and instructions about how to Gift Aid your donation. Thank you! The 82045 Trust will be at the Severn Valley Railway for the popular Peep Behind the Scenes event, September 3rd and 4th. We will have sales stands in the machine shop at Bridgnorth and at Kidderminster station, please visit us for exclusive 82045 clothing items and an assortment of (mainly) railway themed goods. Trust members will also be on hand beside 82045's chassis where we look forward to meeting you and to chat about the project. Here Peter Line, Bryan Clarke and Phil Harvey are guiding the firebox support stretcher into the frames. Mind those fingers! One of the cross stays sitting on top of the brackets to which it will be fitted after machining of the fork ends. 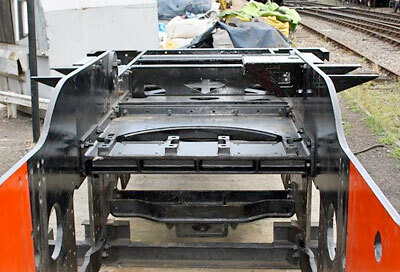 The firebox support bracket in place in the chassis of 82045.